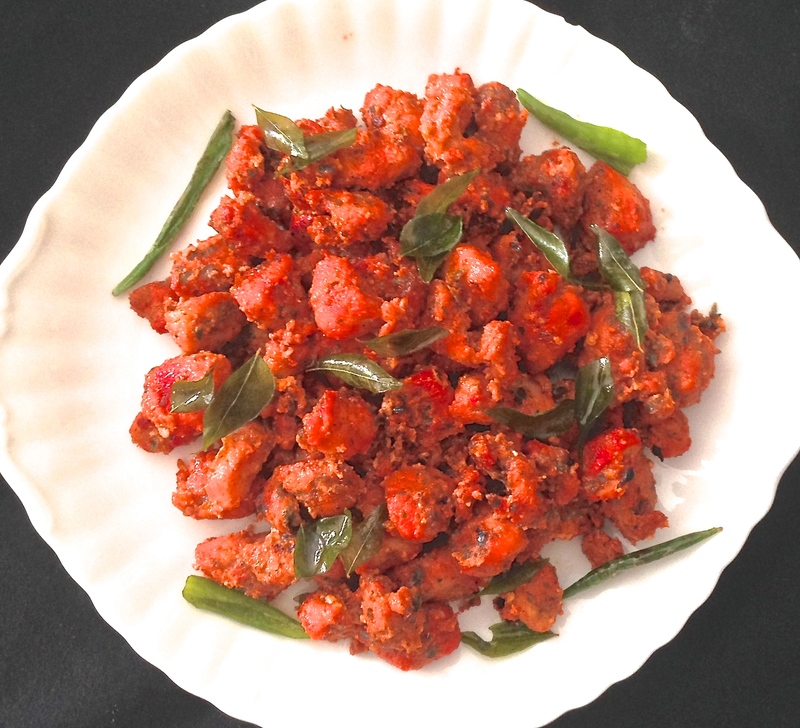 The most frequent question I receive about this South Indian recipe is… why is it called Chicken 65?? There are lots of theories, such as the fact that it was created in 1965, or it has 65 ingredients (which it does not have!) All I can say is that this dish has a wonderful distinct flavor that comes from using a generous amount of curry leaves. Restaurants typically serve Chicken 65 as an appetizer, but personally I like to serve it as a main course since we enjoy it so much. Also, in the traditional recipe, the chicken is deep fried – but as a healthier option, I simply stir fry it and find that it is just as tasty! You can also make Gobi 65 (Cauliflower) or Tofu 65 – no need to marinade, just start by stir frying the tofu or cauliflower. Continue with the preparation below – simply leave out leave out the last step (don’t add the extra garlic, ginger and yogurt). 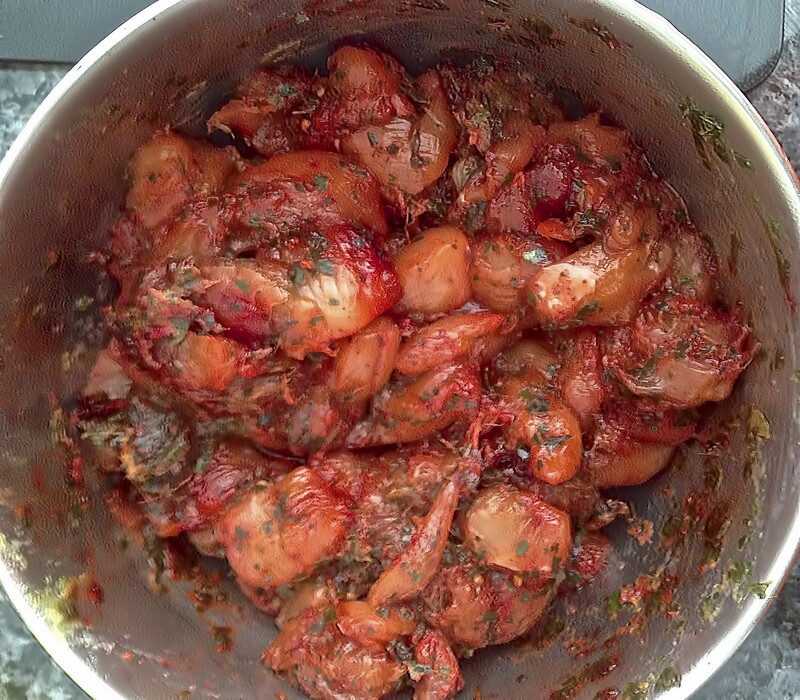 Mix the marinade ingredients together and toss with the chicken. Marinade for several hours. 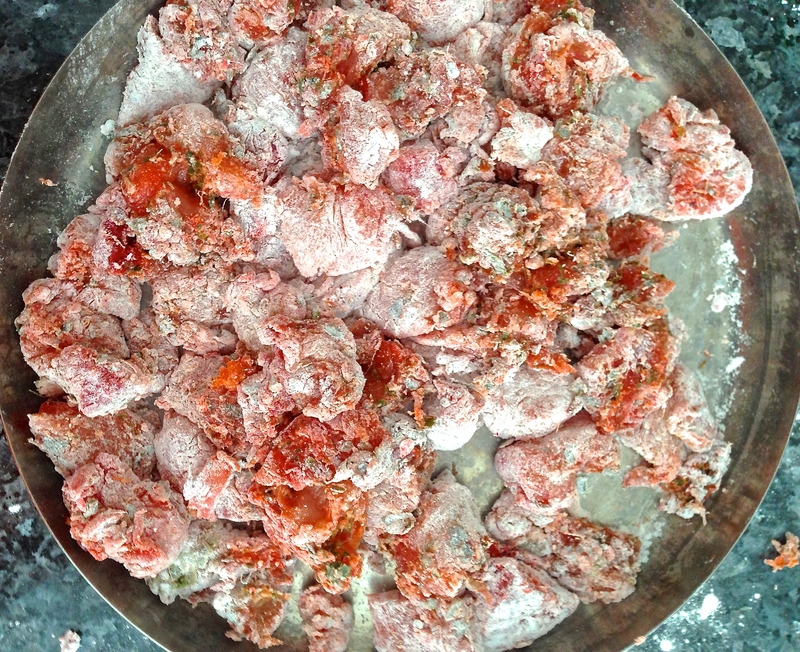 Coat the chicken pieces with the flour mixture . Heat 2 tablespoons of oil in a wok. Add about 1/2 of the chicken pieces and sauté for about 4-5 minutes till cooked (no longer pink inside). Remove and set aside. Repeat with the remaining chicken pieces adding oil as needed. Heat 1 tablespoon oil in the wok, add the green chillies,and curry leaves and stir till the curry leaves are crisp. Remove and set aside. 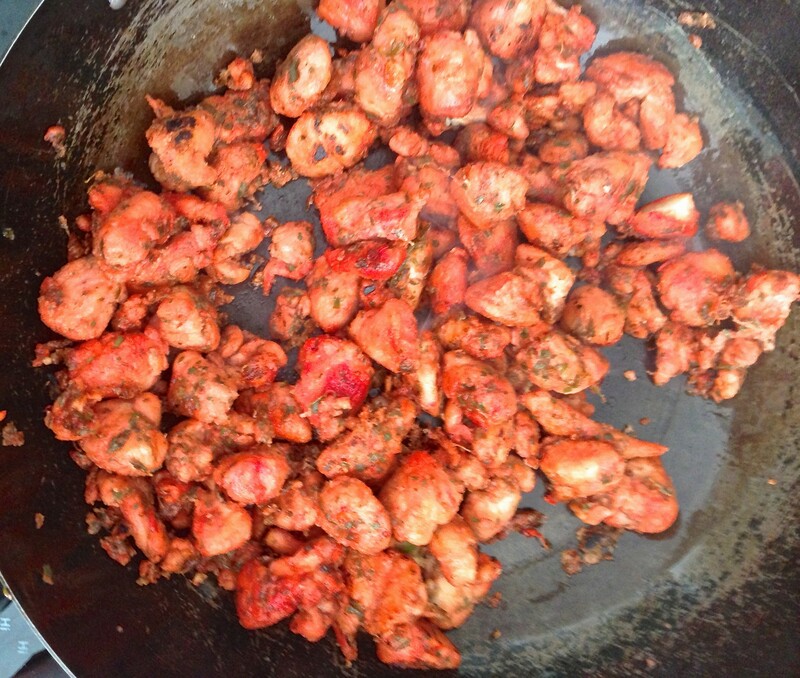 In the same pan add the garlic ginger, salt, coriander powder and stir for 30 seconds. Add the yogurt and stir for a minute on low heat. Add in the chicken pieces into the yogurt mixture and stir for about 2 minutes. Squeeze lime over the chicken. Garnish with cilantro and fried green chillies and curry leaves before serving.